Description of camphor is found in ayurveda and other Vedas also. In Hindu rituals camphor is used primarily.It has various names like in Sanskrit its karpor, farsi its kafur and English its camphor. Let's see its benefits and and how to use it. Apart from the above synthesized camphor is also made and used nowadays. Camphors are used in ayurvedic treatment but Vastu also holds very important uses for it. In vedic Vastu Science before performing any Vastu related remedies camphor is used. By burning camphor all the negativity is destroyed and air is cleaned. That is why its used in sacred fire or Havana as an important ingredient. Burning of desi (original) camphor increases oxygen levels which are good for our body. Any kind of blockage if any is repaid by usage of camphor. Using camphor powder with water and cleaning floor with the same purifiers environment. It has vedic properties which gives it power to remove all the bad Vastu effect from the house. The corner of the house where there is no window and less air supply ,camphor can be used to eliminate all defects. Vastu tips for bedroom. 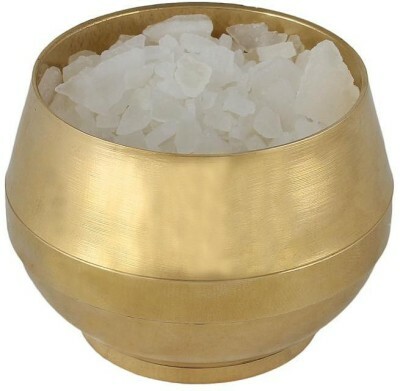 A glass bowl can be used to place camphor. Camphor lamp and diffusers are also available in the market in which camphor can be burnt. Apart from this it can also used with the water to clean the floors of house. Here all the remedies given are based in the 3 types of basic camphor apart from this synthetic camphor should not be used. Camphor is very big , effective and cheap remedy in Vastu Science. Apart from the above benefits Camphor has lot of other benefits. Scientifically known as Cinnamomum Camphora, Camphor is harvested from camphor trees and later processed through steam distillation. Camphor belongs to the Laurel family, which is scientifically known as Ocotea Usambarensis. The chemical formula of this naturally occurring organic substance is C₁₀H₁₆O. It is used as an effective remedy for joint pain as it stimulates the circulatory system. This helps tackle rheumatic diseases, gout, and osteoarthritis. Muscle stiffness, cramps, spasms, and joint and shoulder pain can also relieve in less than 2 weeks with the use of camphor. This antispasmodic can also help promote a sense of calm during pregnancies. Moreover, ingesting camphor in limited and moderated quantities can help reduce the formation of gas as it improves digestion and helps increase metabolism. Camphor can also act as a remedy for those with stubborn nail fungus that has a tendency to recur. Regular use of this antifungal ingredient can help treat similar infections in a period of 3 weeks.